Place poblano pepper on foil under broiler until skin blisters and darkens, about 5 minutes. Seal in foil until cool enough to handle — about 5 minutes, remove skin, seeds and stem; dice. Heat water in small skillet. Add kale and salt, stir until kale is wilted, remove from heat. Place ½ cup beans in a bowl; mash. Add remaining ½ cup beans, diced poblanos and kale; mix. 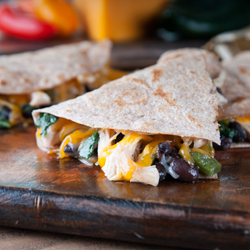 Divide bean mixture among tortillas, top with chicken and cheese. Fold each tortilla in half over filling and lightly coat with cooking spray (on both sides). Heat skillet to medium heat. Add 2 quesadillas; cook until lightly browned on each side (about 2 minutes per side). Repeat with remaining quesadillas. Cut each quesadilla into 3 pieces.